GOOD PUPPY is dedicated to creating tools for early learning years that will improve family dynamics, correct communication, cultivate social skills, eliminate stress and anxieties, grow understanding, raise self-awareness, and promote an empathetic code of ethics. The GOOD PUPPY® brand is a registered trademark of Go Gnomo, LLC, a creative group established in 2012 by designers Marina Tito and Lorenzo Di Alessandro. Roger Good, GOOD PUPPY himself, was born in Florida, in 2001, during the quiet days that followed the most traumatic event our generation had seen. Roger was born from pencil on paper; fresh, innocent, ignorant and a little gullible. He had seen nothing; and his candid wide-eyed innocence resonated with our loss. Roger quickly became the Marina Tito Group’s mascot. He was the design group’s face and voice. You could find him on the website, standing on his soap box, or running from studio to studio giving clients a hilarious tour of the group’s work and capabilities. ; as well as appearing on business cards, estimates, invoices and at the very bottom of every email. Roger was so beloved by clients, that he was given opportunities to freelance for other brands. For ten years Roger conducted the Sunday Run Sale for the Invicta Watch Group, had his own comic strip in their weekly newsletter and was eventually featured on the back-case of a limited edition watch compilation named after him; The Invicta Watch Puppy Collection. Roger loved seeing himself etched on the back of those giant shiny wristwatches. So much that, in 2013, he established GOOD PUPPY BOOKS, where he stood even taller, on three books, on the back of children’s picture books designed to aid with early learning challenges. Roger was thrilled! He chewed on those books like they were made of bacon! But our puppy didn’t stop there. Naturally, Roger loves to play. 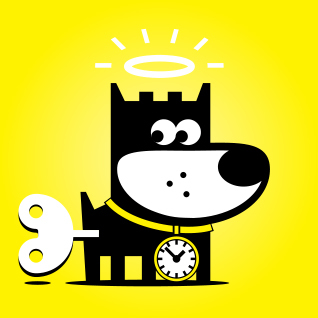 So, in 2014, GOOD PUPPY GAMES launched with DIG, a simple but challenging, retro-inspired endless runner game. TOTAL RECALL, SPACE WALK, and CLUELESS followed because of very specific reasons Roger had and no one remembers. GOOD PUPPY APPS came next, as Roger insisted on a night light. He now keeps a little camp fire burning through the night for all children who are afraid of the dark; you just download your GOOD PUPPY NIGHTLIGHT and bring your silent companion home for the night! Roger loved his apps and games. He was truly happy. But just when we all thought the puppy would take a nap, and maybe let us take a vacation, he happened to overhear a conversation; and then another, and another; and every single one of those phone calls were coming from concerned parents who were having trouble with their children’s behavior. The calls were being made to Gabriel Tito, a family therapist and Roger’s uncle, who would stop by the studio for coffee when in the area in between sessions. Roger wanted to help; and that’s all it took to drag the entire group down this puppy hole. What first begun as a search for the right tools to affect child behavior, quickly turned into the development of tools. What initially started as color coding, eventually grew into the development of an empathetic and inclusive child cognitive behavioral system for home, school and therapy. If you see our puppy napping, he’s probably dreaming up ways to turn early learning challenges into opportunities to elevate minds and build a strong and healthy foundation that will benefit children for life.